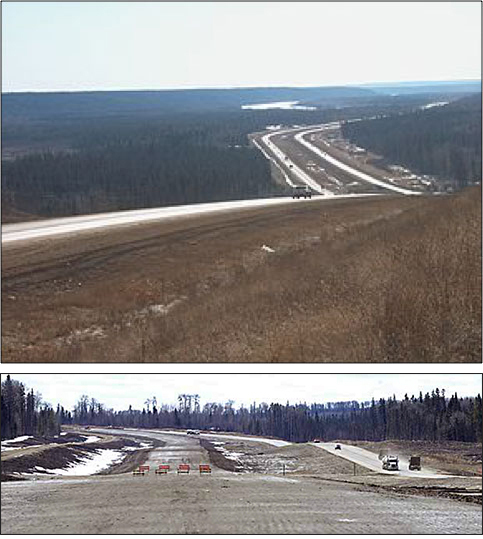 The scope of road work for this 31.2 kilometer section of the Hwy 63 twinning project involved excavation of 7,850,000m³, grading, 564,000 tonne GBC, 153,000 tonne ACP, street light installation and other related work. In addition to the road work, the contract called for the construction of a safety rest/truck staging area, two structural steel girder bridges and one precast concrete girder bridge; this work was completed by Carmacks Bridge Division. This project was on an accelerated schedule and specifications dictated a completion of September, 2015 with no extensions for weather related delays; Carmacks achieved the deadline.